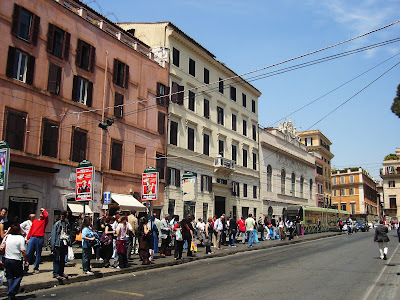 There is a bus stop in Rome, in the area known in antiquity as Campus Martius or Field of Mars, as busy as the bus stop at the Colosseum. It is as unattractive a bus stop as you can find anywhere in any busy metropolis, surrounded as you are with people, the ever present smell of gasoline and the swirling eddies of dust brought on the wheels of buses. I stopped at this bus stop countless times, seeing but not "really seeing" the ruins in front. I think many people fail to notice these ruins because they are hurrying to board a bus or frantically searching for the right bus to board. If this were not Rome, this ruin would be a showcase, with the history attached to it, but being in Rome, Largo de Torre Argentina is just one of the many excavation sites. In ancient times, this place was a holy place (area sacra), where four temples were clustered together. This site was discovered in the time of Mussolini, who had ordered demolition work in the site to build a new building. The 4 temples were built between the 4th and 2nd century. But for a long time not much was known about these temples and were simply given letters to distinguish the four of them. Looking at what remains today, it is difficult to envision what they looked like in their heyday, however, one can distinguish the outlines with the help of the site map. The temples were built by victorious generals in celebration and thanksgiving. Temple A is now known as the Temple of Juturna. The circular temple or Temple B is known as "The Fortune of This Day". It was dedicated to the Goddess of Fortune, parts of whose colossal statue was found on the site and is now displayed in the Capitoline Museum. Temple C is the oldest of the temples and was most probably built to honor Feronia, a roman deity. Temple D is still partially buried and there is no consensus among archaeologists as to whose temple this is. Behind Temple B and D was located the wall of the Curia of the Porticus of the theater of Pompey, where Julius Caesar was assassinated on the Ides of March. Later on, during the imperial age this was converted into a "monumental latrine", a fanciful name! I wonder if every year at the Ides of March Caesar makes an appearance to protest this construction! Apparently today on these sacred grounds, stray cats roam freely as this site is supposedly a sanctuary for homeless cats. However, on my visit I didn't see a single one!